At the end of the Wikipedia Year of Science, we tallied the contributions our 287 science courses contributed: 4.93 million words added to 5,640 articles, including 622 new entries, viewed 270 million times just during their respective terms. That means we added the equivalent of 11% of the last print edition of Encyclopedia Britannica to science content on Wikipedia during the Year of Science. Our fall term wrapped up in December, with us supporting more than 6,300 students in 276 courses. In the fall term, student editors added 4.2 million words of content across all disciplines, providing better content for 253 million readers. We announced new Wikipedia Visiting Scholars that will be working with the University of San Francisco’s Department of Rhetoric and Language and San Francisco State University’s Paul K. Longmore Institute on Disability. We released an addition to our series of subject-specific editing brochures: Editing Wikipedia articles on Political Science. In December, Outreach Manager Samantha Weald, Classroom Program Manager Helaine Blumenthal, Director of Programs LiAnna Davis, and Educational Partnerships Manager Jami Mathewson attended the final academic conference during the Wikipedia Year of Science. 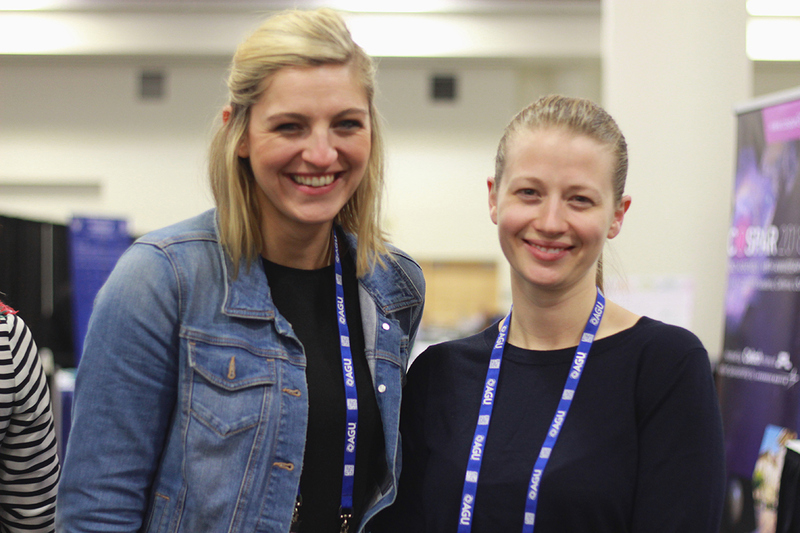 At the American Geophysical Union’s annual meeting in San Francisco, staff members met earth scientists eager to improve Wikipedia’s content. At the conference, we spoke to dozens of scientists who believe Wikipedia is a valuable website for them, their students, and the world. We’re excited to bring more geophysics, geology, and earth science students to Wikipedia in the coming years, helping us amplify the impact of this year’s Wikipedia Year of Science. As we wrapped up another year of recruitment, we reflected on our aim to increase the Wiki Education Foundation’s visibility to university and college instructors in the United States and Canada. Over the course of the year, we attended 23 conferences to share Wiki Ed’s mission with university instructors. We also made 12 campus visits, where Wiki Ed’s program participants hosted us to encourage their colleagues to join our efforts. Additionally, we hosted four outreach webinars. Through these outreach initiatives, we brought more instructors than ever into the Classroom Program, supporting a record 515 courses and nearly 11,000 students in 2016. 276 Wiki Ed-supported courses were in progress (130 or 47%, were led by returning instructors). 6,307 student editors were enrolled. 60% of students were up-to-date with the student training. Students edited 5,700 articles, created 722 new entries, and contributed 4.18 million words. The Fall 2016 term has come to a close, and we’re busily preparing for Spring 2017. Our most successful term to date was defined by growth, productivity, and experimentation. With 276 courses doing Wikipedia assignments, the Classroom Program has grown to nearly triple the size it was in Fall 2014. And of course with this rapid growth, our students are having an even greater impact on Wikipedia. To ensure that all of our instructors and students get the support they need, we implemented several new programs during the Fall 2016 term, including a series of interactive webinars and a more robust help section built into the Dashboard. While we’re proud of the above numbers, the true success of the Classroom Program is, in some ways, immeasurable. As recent events have demonstrated, fake news poses a serious threat to an informed citizenry. 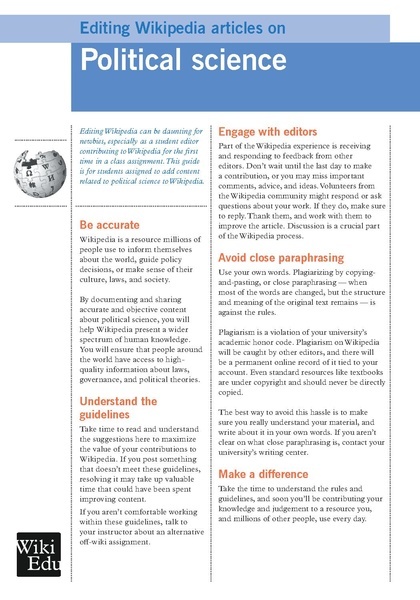 Students who learn how to contribute to Wikipedia are not only making reliable information available to the public at large, they are also developing critical media literacy skills that enable them to discern real from fake sources of information. In learning Wikipedia’s strict policies around sourcing, our students know to question headlines and to dig deeper. These are lifelong skills that not only serve our students, but society more generally. The close of 2016 also marked the end of the Wikipedia Year of Science. During this year-long initiative, we strove to improve Wikipedia content in STEM and social science fields, while developing critical science communication skills among our students. Our Year of Science campaign consisted of 287 courses and 6,270 students. Together, they contributed 4.93 million words to 5,640 Wikipedia articles, including 622 new entries, and their work was viewed 270 million times in the spring and fall terms alone. A specific goal of the Year of Science was to improve Wikipedia’s coverage of women scientists, and our students either expanded or created well over 100 articles on important but overlooked women in the sciences. While the Year of Science has come to an end, we recognize that our work in this area has, in many ways, only just begun. Science literacy, along with media literacy, are key components of an accurately informed society, and we will continue to prioritize both going forward. The Wikipedia article on angel food cake was among those improved in Richard Ludescher’s Food Physical Systems class at Rutgers University. 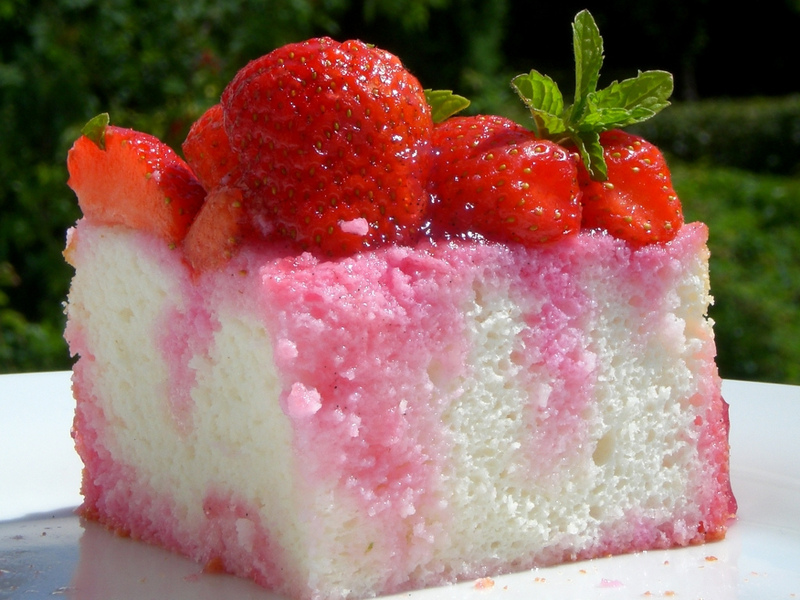 Image: Angel food cake with strawberries by F_A, CC BY 2.0, via Wikimedia Commons. When we think about food, we think about taste, preparation, and whether it’s healthy or not. We rarely think about things like hydrogen bonding, electrostatic interactions, or Van der Waals interactions. But these are important aspects, and thanks to students in Richard Ludescher’s Food Physical Systems class at Rutgers University, information of this sort is now available through a number of Wikipedia articles. A student in the class expanded the angel food cake article by adding sections about the manufacturing process, the ingredients used in commercial production, and the physical and biochemical roles played by these ingredients in the final product. Another student expanded the croissant article by adding information about their manufacturing and the changes in the physical and chemical properties of ingredients during manufacturing, baking, and storage. Other students added information on the physical and chemical properties of a number of other foods including marshmallows, mayonnaise and chewing gum. The expansion of the meat analogue article added information about the composition, processing, and physical structure of the product that are required to mimic the texture and taste of meat. Students in Glenn Dolphin’s Introductory Geology class continued their work expanding biographies of women geologists. Maria Crawford contributed to lunar petrology, continental collisions (on earth) and the geology of the Pennsylvania Piedmont, but at the beginning of the term her Wikipedia biography was only four sentences long and said nothing of her contributions. A student turned that stub into a substantial article which documented her achievements from a career that spanned four decades. Another student created an article on Virginia Harriett Kline, a a stratigrapher who earned a Ph.D. in geology in 1935 and made important contributions to petroleum geology. Other students in the class continued to expand the articles they had worked on earlier in the term. Early studies of child psychology often focused on conflict and aggression. Lois Barclay Murphy chose instead to focus on normal childhood development; she played an important role in the development of that field. Marvin Zuckerman played an important role in the development of the field of sensation seeking. Mary K. Rothbart is an expert on infant temperament development. Rena R. Wing is an expert on the behavioral treatment of obesity. None of these psychologists had biographies on Wikipedia. Similarly, the field of geriatric psychology had been omitted. These were among the articles created by students in James Council’s History and Systems of Psychology class at North Dakota State University. Other students worked to expand existing articles, like the profile of mood states, which was expanded from a short stub into a substantial article. One of Wiki Ed’s great successes has been recruiting professors in archaeology and anthropology to expand and improve articles on archaeological sites, artifacts and methods. There are thousands of sites which are notable but not covered in Wikipedia — students in courses like Rice University’s African Prehistory have added to articles like Manyikeni in Mozambique and KM2 and KM3 in Tanzania. They’ve also updated the article on South Africa’s Border Cave, an already substantial article which now covers more modern work on the site and artifacts found within it. Critical theory is hard work. Explaining it to laypeople is even harder. Doing so on Wikipedia, harder still. The language of critical theory (in nearly any discipline: law, economics, feminism) is often disjoint from or at odds with the main voices in the discipline — otherwise it’s hard to say it’s critical! Students in John Willinsky’s Critical Theory and Pedagogies outdid themselves in added to Wikipedia’s coverage of critical mathematics pedagogy, critical pedagogy (a hard phrase to hear for the policy debate veterans in our audience), and expanding coverage of books like Learning to Labour, a critical educational ethnography. Work on narrow, difficult topics like critical pedagogy of place requires research and preparation and the students’ work speaks to the hard work they’ve done. Finally, interim Content Expert Rob Fernandez, who graciously agreed to join our staff temporarily to help out with the rush at the end of the fall term, wrapped up his contract with Wiki Ed in December. Rob’s help to ensure our student editors and instructors got top-notch support was invaluable. Thank you for your contributions, Rob, and best of luck on your new job! Barbara Page’s article about thrombosis prevention explains treatments to prevent the formation of blood clots inside a blood vessel. 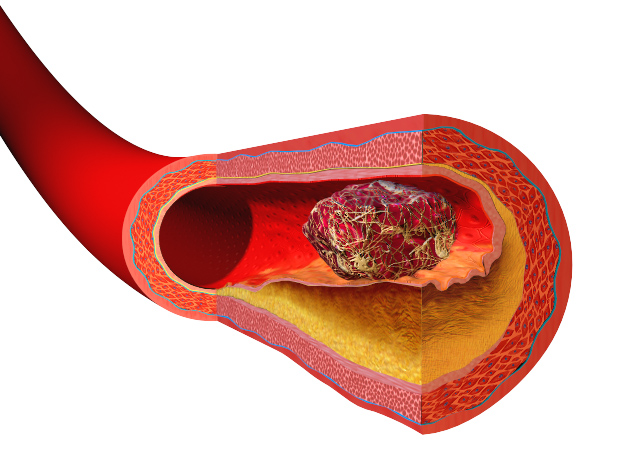 Image: Blausen 0088 BloodClot.png by Blausen.com staff, CC AT 3.0, via Wikimedia Commons. Community Engagement Manager Ryan McGrady announced two new Visiting Scholars positions at the beginning of this month, which got their start at the very end of last month and are already using institutional resources to improve Wikipedia. User:Lingzhi partnered with the University of San Francisco to improve rhetoric and language topics, and Jackie Koerner is developing articles on disability, such as disability in the United States, with the Paul K. Longmore Institute on Disability at San Francisco State University. Existing Scholars continued to produce great work. George Mason University’s Gary Greenbaum had another article achieve the impressive Featured Article designation, Alabama Centennial half dollar. The University of Pittsburgh’s Barbara Page built up her portfolio of impressive medical editing with substantial improvements to Wikipedia’s entry for thrombosis prevention. The community is getting ready to start the 11th annual WikiCup competition, in which experienced editors are awarded points for producing high-quality content. For the 2016 event that just ended, Wiki Ed sponsored a side competition with prizes for the two users with the most Good Article and Featured Articles on scientific topics. In first place was also the overall winner of the competition, User:Casliber, who developed articles like the violet webcap mushroom and the Lynx constellation. In second place, despite sitting out for the final round of the competition, was User:Cwmhiraeth, who improved some very big topics like millipede and habitat. Our newest subject-specific editing brochure will help students working on political science articles. LiAnna Davis has been working with San Francisco-based media firm PR & Company to pitch stories to national press about impact Wiki Ed’s programs are having, and especially the impact of the Year of Science. We announced the newest in our series of subject-specific editing brochures in December: Editing Wikipedia articles on Political Science. Thanks to the Wikipedia editors and partners at the MPSA who provided review and/or feedback for this. Continuing with the main technical focuses from last month, Product Manager Sage Ross spent December focused on collaboration and mentorship, as well as working on bug fixes and feature development. Sejal Khatri started her Outreachy internship this month to improve the Dashboard’s user profile pages. She’s already made considerable progress toward our plans for these profile pages, and she’s made several improvements and bug fixes for course pages as well. Check out Sejal’s latest post on her internship blog to see what she’s been up to. December was also a busy month for the high school students participating in Google Code-In. Sage has been mentoring them on Dashboard tasks, including some performance and accessibility improvements, documentation and testing, bug fixes, and new features to help Wiki Ed staff handle new courses more efficiently. This month saw contributions to Wiki Ed’s codebase from nine developers outside of our staff and contractors — a new record. Sage developed the initial version of an Article Viewer tool that lets you see a full Wikipedia article — as it looks on Wikipedia — without leaving the Dashboard. The Article Viewer is currently available alongside the Diff Viewer when you zoom in on a particular edited article in a course’s Articles tab. In anticipation of increased Dashboard usage in 2017, in late December — just before Christmas weekend — we migrated the software to a more powerful server. The ensuing 20 minutes were the only downtime for the Dashboard during the entire 2016 term (although a handful of network disruptions and problems with Wikimedia servers did affect Dashboard users at earlier points in the term). In December, Research Fellow Zach McDowell completed the 13 focus groups portion of the research program. A total of 475 minutes of focus group recordings were sent away for transcription, resulting in more than 250 pages of text for analysis. Survey research participation continued to grow, with more than 1,200 responses in the pre-assessment as well as more than 850 responses for the post-assessment. Surveys close on January 17, 2017. Zach spent the remainder of his time beginning preliminary assessment of the data and cleanup plan. Additionally, Zach has been seeking out a graduate student to engage as a data science intern to expedite the analysis process of the data. Wiki Education Foundation’s San Francisco team holiday party. 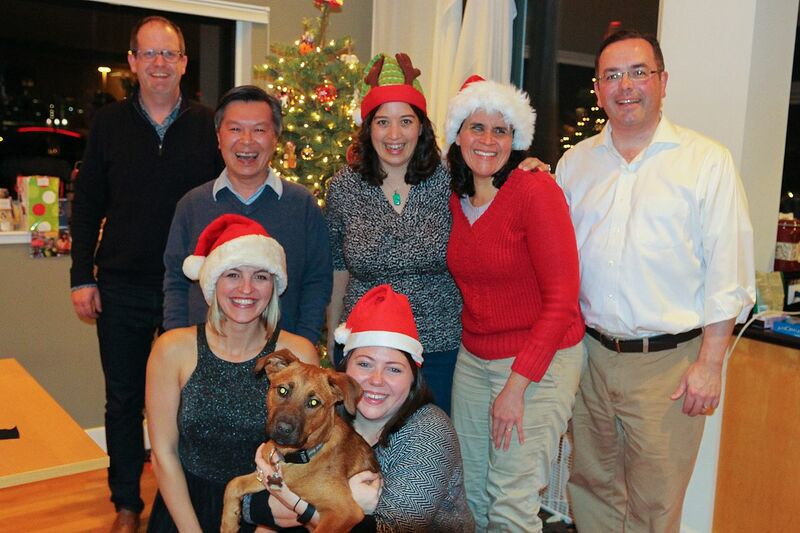 To celebrate the holiday season, San Francisco based staff gathered at LiAnna’s house for a holiday party. Executive Director Frank Schulenburg led the group in the creation and consumption of a Feuerzangenbowle, and we enjoyed dinner and games. 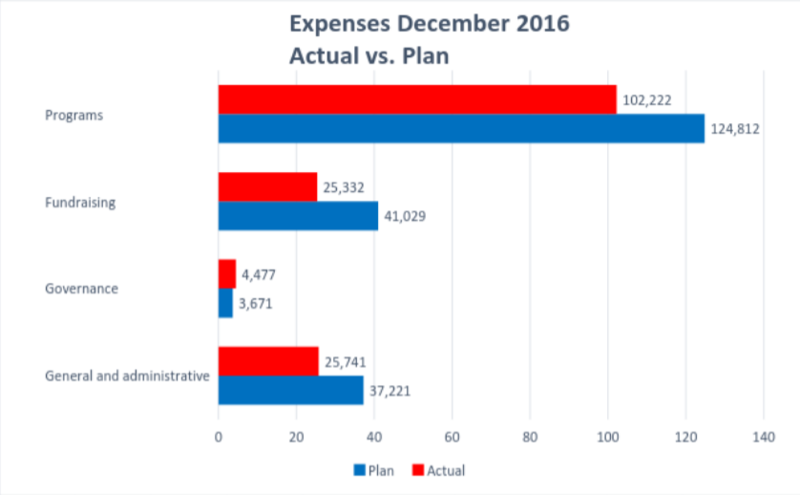 For the month of December, expenses were $157,772 versus the approved budget of $206,733. The majority of the $49k variance continues to be due to staffing vacancies ($13k); as well as the timing of outside professional services ($22k), and the printing ($11k) expenses. 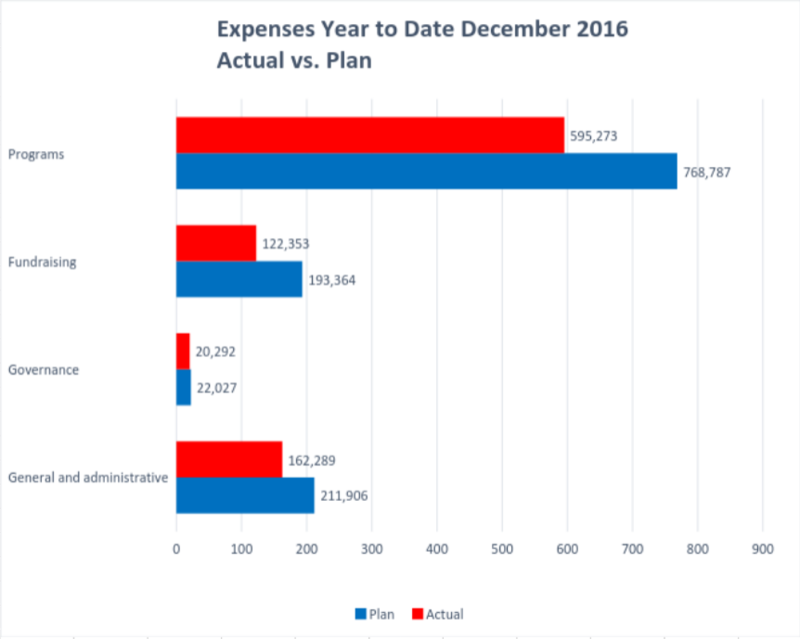 Our year-to-date expenses of $900,208 was also less than our budgeted expenditures of $1,196,085 by $296k. Like the monthly variance, the year-to-date variance was also largely impacted by staffing vacancies ($100k). In addition, the timing and deferral of professional services ($69k); marketing and cultivation ($18k); volunteer workshops ($13k); and printing ($18k); as well as savings in staffing related expenses ($16k) and in travel ($61k) contributed to the variance. Wiki Ed conducted its first–ever individual donor acquisition mailing, which reached more than 11,000 individuals. Appeals were sent via U.S. Mail in late December. Google renewed their support with a $20,000 gift to Wiki Ed. In order to be able to share an early outline of our future programmatic work with the board, Frank traditionally starts brainstorming ideas with senior staff in December. That’s why this month we embarked on thinking about the general direction for the upcoming fiscal year 2016–17 and developed a vision for the time ahead to be shared with the board on January 28–29. Frank also started conversations with existing and prospective funders on some initiatives that are in our project pipeline for 2017. These conversations – as well as our projections of the expected impact – will inform our roadmap for the upcoming year and beyond. Also in December, Frank prepared a series of documents for an ad hoc board taskforce that will look into additional funding streams prior to the in-person board meeting at the end of January. The board taskforce meetings will start next month via video conference with the goal of coming up with a recommendation to the board as a whole.